This page provides some advice on how to secure items inside a metal shed/bike store/bike hut, and the shed itself. We have other advice pages about bicycle security, wooden shed security and a general Security FAQ. Shed crime is on the rise - Bike stores are obvious targets for thieves! Metal bike stores often have very poor security. They often contain quite high value items, especially bicycles, and quite often several bicycles. They are also quite obvious to thieves in that there is likely to be one or more bicycles in a bike store. 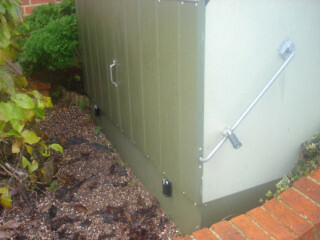 Fortunately, improving security of metal sheds and of items within them is not that difficult. The photo to the right shows a typical metal bike store. This one has been fitted with improved locks. Unfortunately, this shed was subsequently defeated by a thief as the attachment points for all of the locks were very poor, using only thin metal and were therefore very vulnerable to attack with various tools. The result, shortly after, can be seen below. These photos show the effect a thief had on the same shed above. All of the locks were disconnected from the hasps/plates by simply snipping the poor quality fittings. This was likely done with small bolt croppers in a fairly silent and quick attack, despite the shed being in someone's front garden! The higher-quality locks achieved very little in this case as the thief didn't attack them and instead went for the weak points, which were the fittings. Snipping these fixings allowed the thief to open the lid on the shed. If items were not independently locked inside the shed, the thief would likely have helped himself. 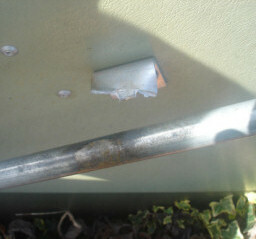 Metal Bike Shed Tip #1: Secure the door/lid! Trying to keep a thief outside the shed is the first aim as, if you succeed, further deterrents are just extras that will hopefully never be tested. This is easier said than done on most metal sheds as the manufacturers often skimp on metal thickness around the fixings and the hasp arrangement, such as it is, can be quite easy for a thief to attack, as shown above. It is still worth using a decent lock at each locking position, but do not rely on this alone (as evidenced by the photos above). Beware: Even with good locks, a lot of commercial metal bike stores are not really that secure at all! Metal Bike Shed Tip #2: Use a security anchor inside the shed, as well as any locks on the outside! The owner of the shed above had, very fortunately, already fitted an anchor inside this shed and he had his high-value bicycles secured to it with a good quality chain. That person had approached us for help in improving the security of his metal shed and we had worked together to develop a variation on our popular Shed Shackle product so that it could be used in metal sheds rather than wooden sheds. 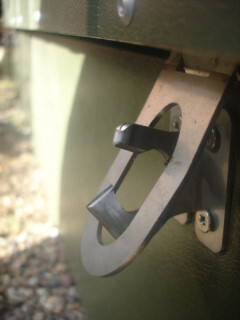 This was the first installation of the Metal Shed Shackle, as shown in the photo below. The thief left empty-handed as a result. This photo shows the Metal Shed Shackle, in red, fixed to the wall at the rear of the shed, and a Protector 11mm chain 2.0m long and Squire SS50CS padlock securing three bikes. Note that the chain goes through the frames of every bike and also the rear wheel of the most exposed bike. Note also that the chain is off the floor. The Metal Shed Shackle, fitted like this, helps to hold the weight of the chain so it is easier for you to lock the bike(s) and it naturally helps to hold the chain and lock away from the floor so it is harder for a thief to attack. The setup above could be improved, slightly, by securing the front wheel/the wheels of the other bikes with a D-lock or another/longer chain, but if the wheels are not particularly valuable, this is generally not a high priority. Bikes that do have high-value components can warrant additional security and are more likely to require something like a Protector 13mm chain as the main defence. Another option, albeit harder to install, could be to fit a Torc ground anchor a to gain a higher level of deterrent if the shed is sitting on concrete, or if you don't mind the extra effort of laying fresh concrete. A ground-fitted anchor can also be harder to use in a bicycle store as they are at ground level and the frame of the bike is significantly higher. This can also mean that a longer chain will be required. 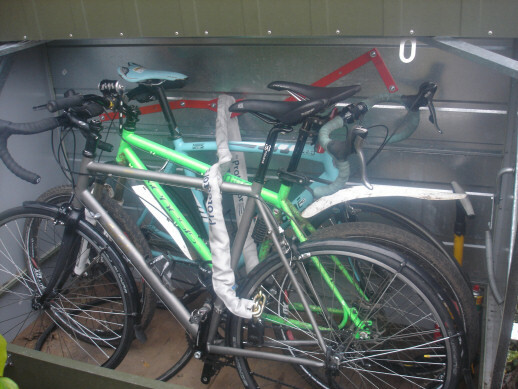 Metal Bike Shed Tip #3: Use a good quality chain and lock and use them properly! It is important to choose the appropriate type of chain and lock to suit the value of the item(s) to be secured. We have advice on bicycle security that includes guidance on chain selection and use.